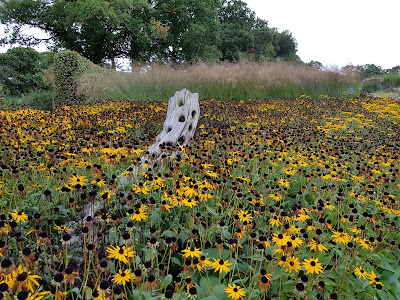 Paul and Pauline McBride created a prairie garden in a field on the family farm in Henfield, Sussex. It is one of the most stunning examples of prairie planting I've ever visited. 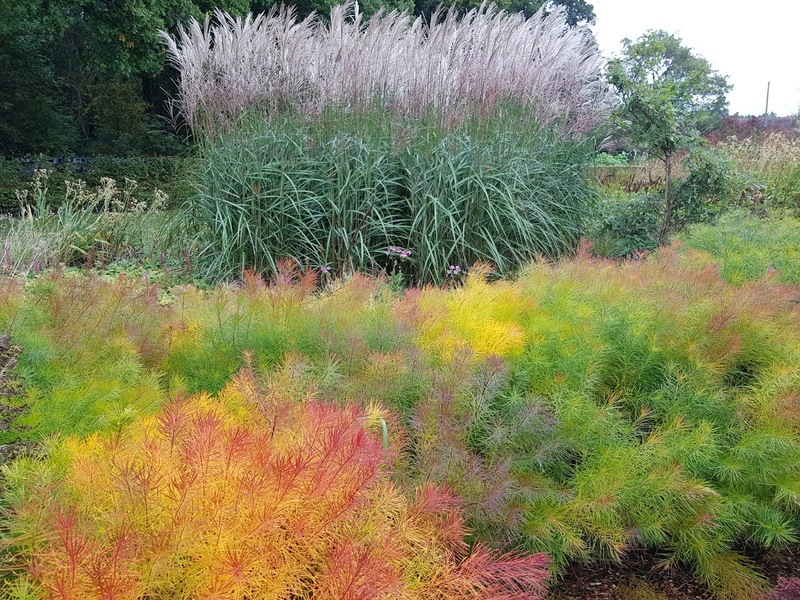 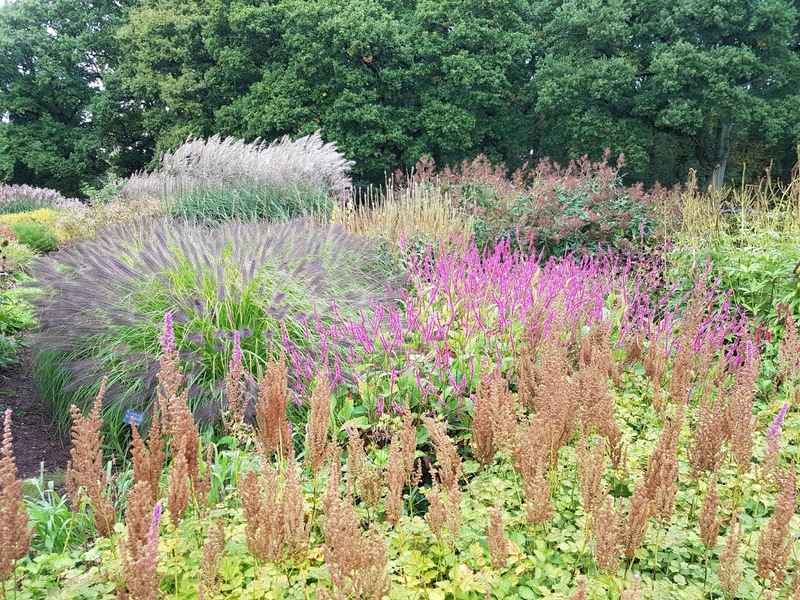 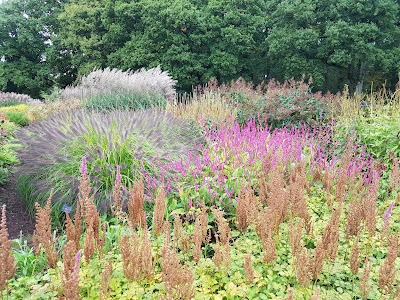 With large swathes of planting, waves perennials interespersed with drifts of grasses, the combination of colours, textures and shapes is incredibly beautiful. 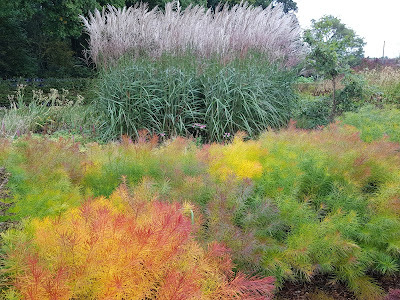 The grasses are probably at their best now, in autumn. The plants will be left to form seedheads into the winter and provide food for birds, then early next year the whole lot is burned, ready for regeneration the next season. 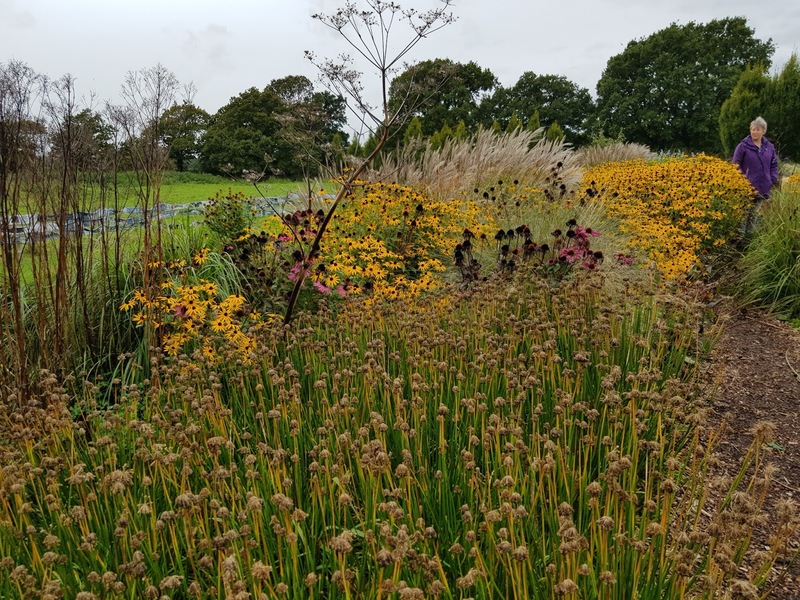 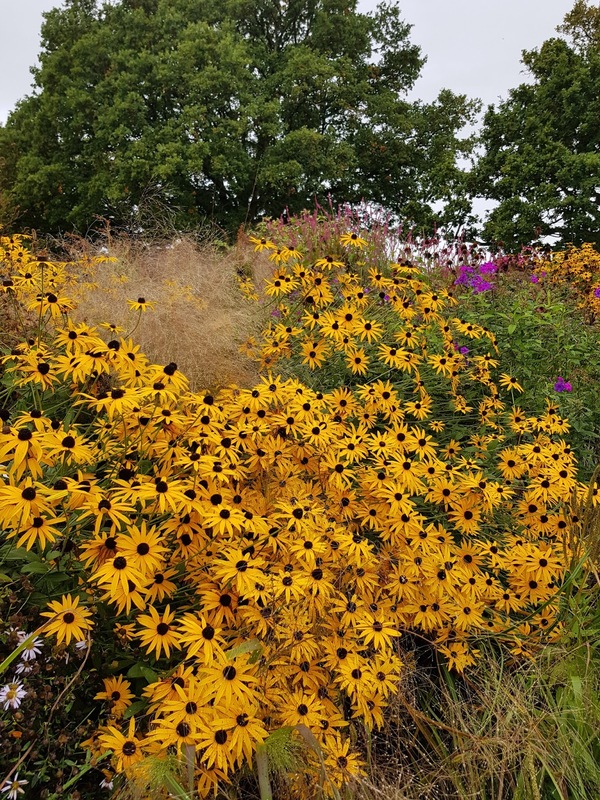 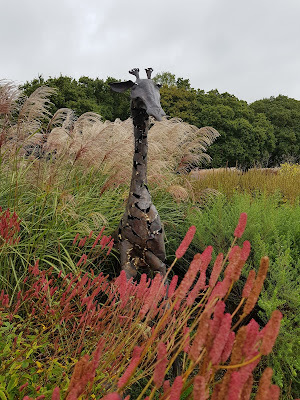 Sussex Prairie Garden is set over 8 acres with wide curved beds, with bark chip paths running through the middle of each so that you can get right up close to the plants. 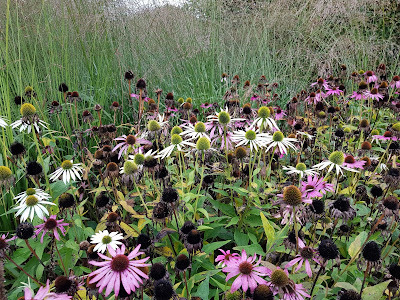 This you will want to do - the grass fronds, cobwebby or soft like cat's fur, are immensely touchable. 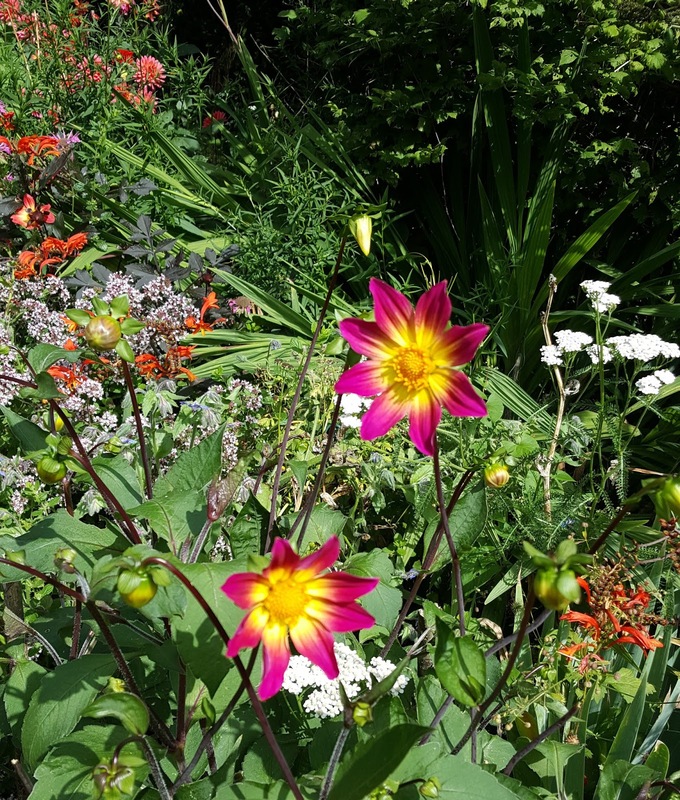 Also contained within the garden is a teashop with excellent homemade cake (courgette, mango and lemon drizzle, sticky toffee...) and a shop selling many of the plants from the garden and also sourced elsewhere. 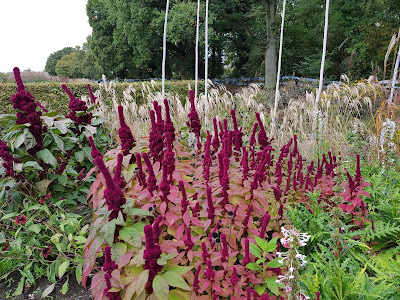 Many of these are quite rare and not your run-of-the-mill garden centre cultivars, so well worth a look. 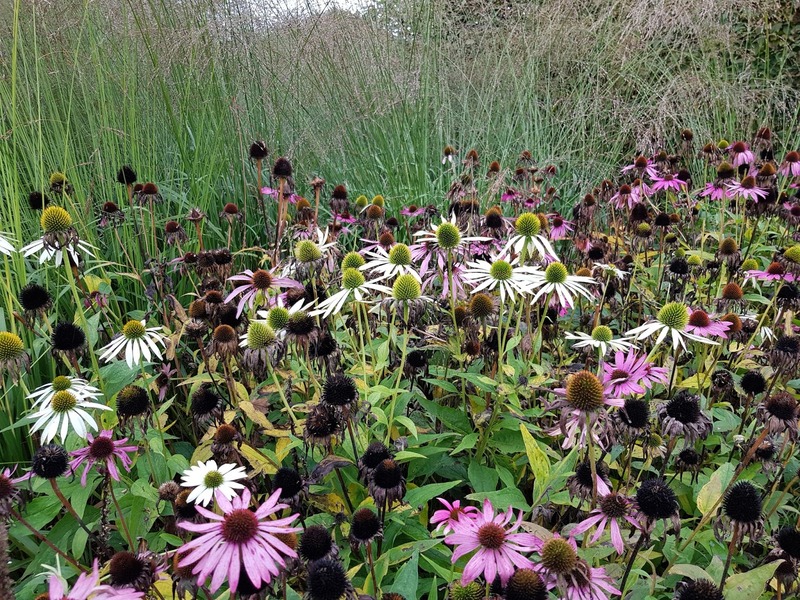 Sussex Prairie is open 6 days a week (closed Tuesdays) from 1.00pm-5.00pm until October 15th. 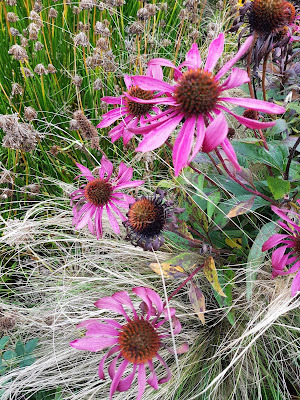 It's an RHS partner garden so RHS members go in free, otherwise it's £7.00 for adults, £3.50 for children. 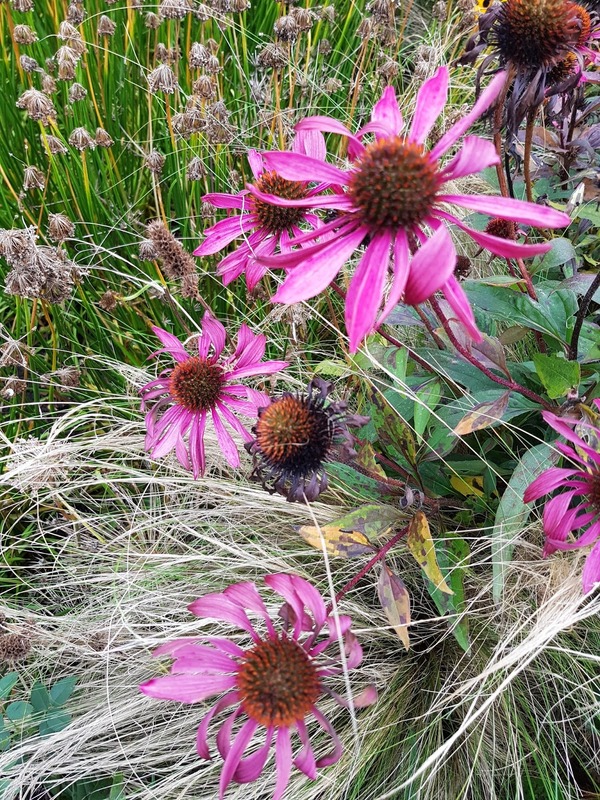 As many summer blooms begin to fade with the advent of autumn, those flowers which will gamely carry on until the first frosts are especially welcome. Verbena, Rudbeckia and Geranium Rozanne are all earning their keep in the garden right now, but nothing can compete with the sheer showiness of dahlias, now in their pomp and bringing dazzling colour and dramatic shapes to the border. Whether singles, doubles, pompoms, or dinner plates, the flowers demand attention. 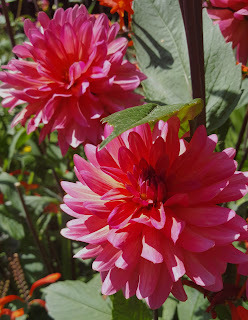 Personally, however much I admire the flower forms that look like old-fashioned bathing hats, or sea anemones, it is the simpler blooms that have enduring appeal. 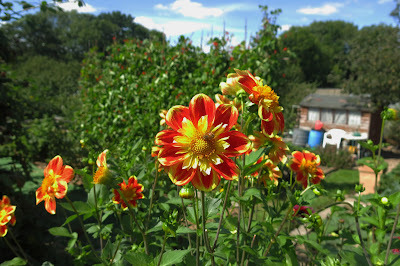 Nothing like some old-fashioned ecclesiastical dahlias to produce masses of flowers throughout the autumn. Keen dahlia growers will disbud and prune side stems to encourage fewer but larger flowers; I'm content to deadhead - when I remember - and give the plants some discreet support as they grow tall. An open-topped paeony support, fixed before the dahlia begins to shoot up, is ideal, but I never remember, or never have spare supports, at the right time and usually end up with cane and string as usual. 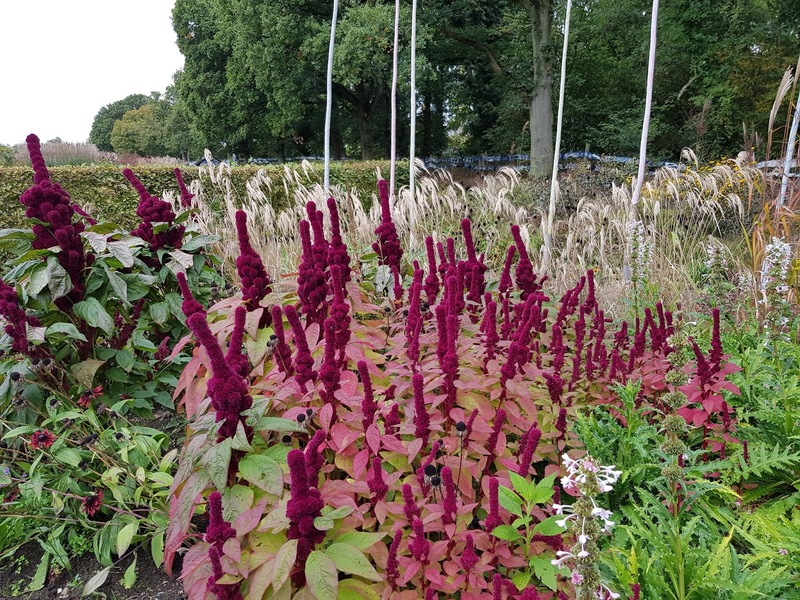 After the first frost it's time to cut down the stems and then the big question is whether to leave the tubers in the ground, mulch on top with bark chips and cross one's fingers, or whether to lift the tubers and hang upside down somewhere dry, and cold but frost-free, for the winter. 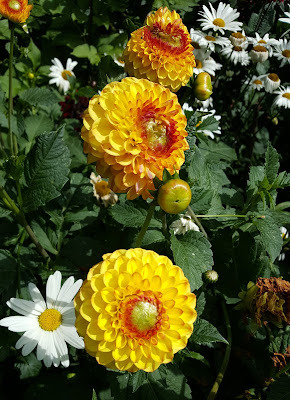 I've found I can usually get away with leaving them in my London town garden, but it's obviously better practice to lift them. 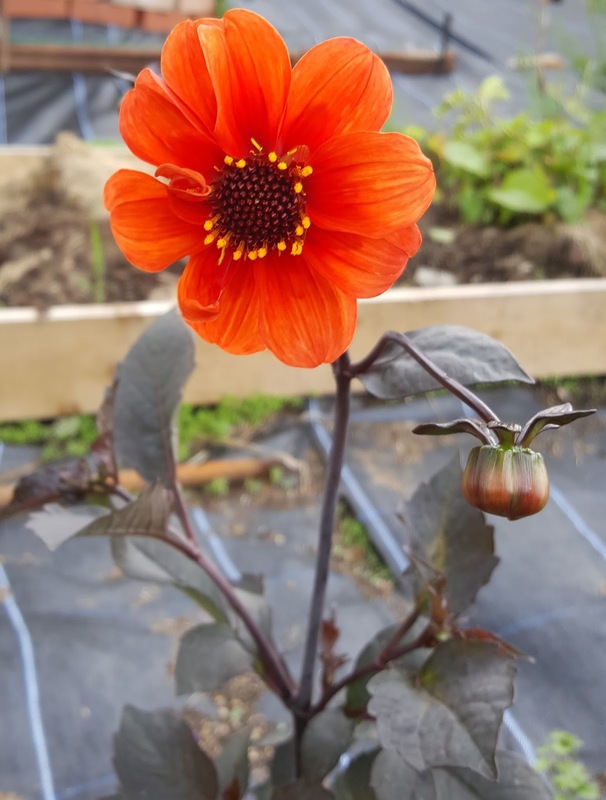 Come springtime when it's time to put the tubers back in the ground, you can also increase your stock by dividing up healthy ones. 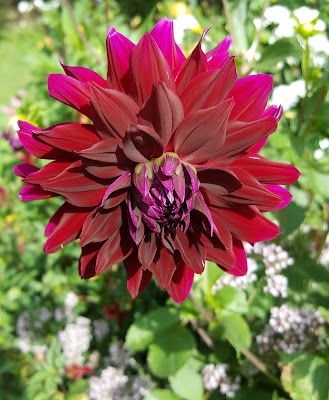 Find tubers with more than one 'eye' or incipient bud and cut cleanly so that each eye comes with a nice plump bit of tuber attached. Leave for a couple of days for the wound to heal before planting. 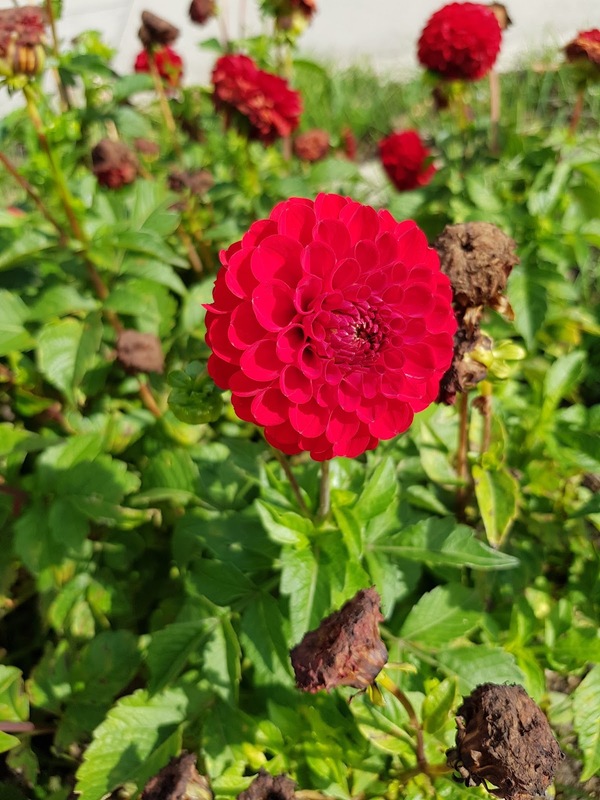 Star dahlias with their petals curling inwards look like children's seaside windmills and have a delicate prettiness in contrast to the exhibitionist tendencies of pompom and cactus dahlias. 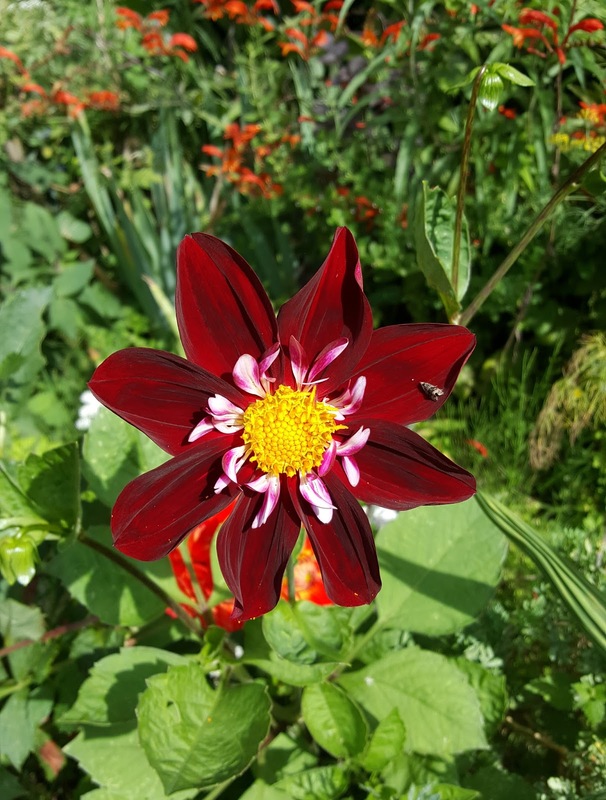 Collarette dahlia, named for the collar of smaller florets around the central yellow disc. This is Night Butterfly. 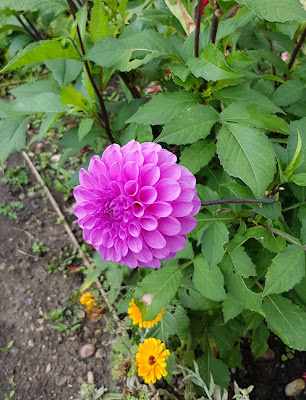 Ball dahlia flower: bigger than pompoms but with the distinctively curled petals. 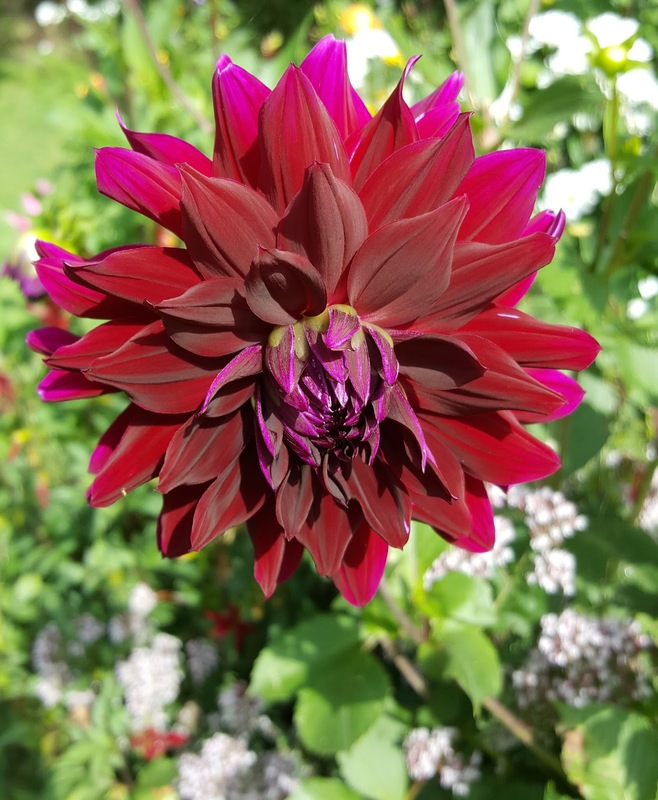 Bishop of Oxford: Bishop dahlias have dark leaves which contrast with the bright single flowers. Dahlia Bright Eyes is a stunning single flowered cultivar in hot pink and gold. 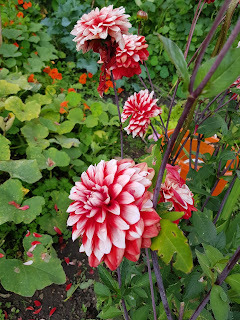 A dinnerplate of a decorative dahlia: Fubuki Red and White.